Welcome to La Nueva Casita Cafe. 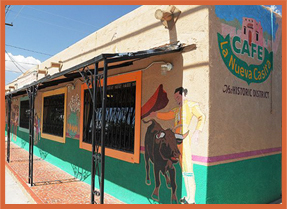 Established in 1957 and located in the Historic Mesquite District, along the original Camino Real Route, La Nueva Casita Cafe has become a staple of downtown Las Cruces. Take a drive along Main Street downtown, the original town-site of Las Cruces, then, come on in for a dining experience you're sure to remember. From the moment you walk in, our friendly staff will make you feel right at home. La Nueva Casita Cafe stands on traditional values. Our purpose is quite simple, to provide delicious, authentic, made from scratch Mexican cuisine, at a value that can not be beat. We'll be sure to "WOW!" each and every guest with outstanding customer service. So come on in and experience what Las Cruces has to offer. Remember at La Nueva Casita Cafe, "Our Casa es Su Casa".